Cornwallite: Mineral information, data and localities. Verdigis green, blackish-green, emerald-green; emerald-green in transmitted light. 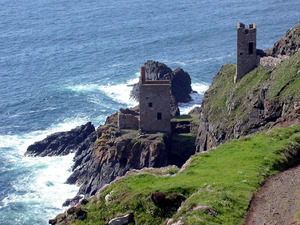 Named in 1846 by František Xaver Maximilian Zippe after Cornwall, England, wherein lies the type locality. The arsenate analogue of pseudomalachite. The monoclinic dimorph of cornubite. A secondary mineral formed by the oxidation of ore containing both copper and arsenic (e.g, tennantite). Satiny or rough on surfaces from terminations of minute crystals. Microcrystalline, radial fibrous botyroidal to globular and vitreous crusts. Less common as rounded tabular to blocky crystals. The Natural History Museum, London, England, MI 1985,1754. Olivenite 77 photos of Cornwallite associated with Olivenite on mindat.org. Clinoclase 70 photos of Cornwallite associated with Clinoclase on mindat.org. Azurite 31 photos of Cornwallite associated with Azurite on mindat.org. Malachite 27 photos of Cornwallite associated with Malachite on mindat.org. Cornubite 22 photos of Cornwallite associated with Cornubite on mindat.org. Agardite-(Ce) 21 photos of Cornwallite associated with Agardite-(Ce) on mindat.org. Quartz 18 photos of Cornwallite associated with Quartz on mindat.org. Strashimirite 18 photos of Cornwallite associated with Strashimirite on mindat.org. Conichalcite 16 photos of Cornwallite associated with Conichalcite on mindat.org. Chrysocolla 14 photos of Cornwallite associated with Chrysocolla on mindat.org. 20.1.7 Geminite Cu(HAsO4) · H2O Tric. 20.1.9 Strashimirite Cu8(AsO4)4(OH)4 · 5H2O Mon. 20.1.14 Ceruleite Cu2Al7(AsO4)4(OH)13 · 11.5H2O Tric. 20.1.16 Arthurite CuFe3+2(AsO4)2(OH)2 · 4H2O Mon. Haidinger (1828) Annalen der Physik, Halle, Leipzig: 14: 228 (as Erinite). Haidinger (1828) Philosophical Magazine and Journal of Science: 4: 154 (as Erinite). Turner (1828) Philosophical Magazine and Journal of Science: 4: 155. Zippe, F. X. M. (1847): Über den Cornwallit, eine neue Species des Mineralreichs. Abhandlungen der Königlichen Böhmischen Gesellschaft der Wissenschaften 4, 649-654. Greg, R.P. and Lettsom, W.G. (1858) Manual of the Mineralogy of Great Britain and Ireland. 483pp., London: 321. Church (1868) Journal of the Chemical Society, London: 21: 276. Hillebrand and Washington (1888) American Journal of Science: 35: 299. Larsen, E.S. (1921) The Microscopic Determination of the Nonopaque Minerals, First edition, USGS Bulletin 679: 63, 72. Berry, L.G. 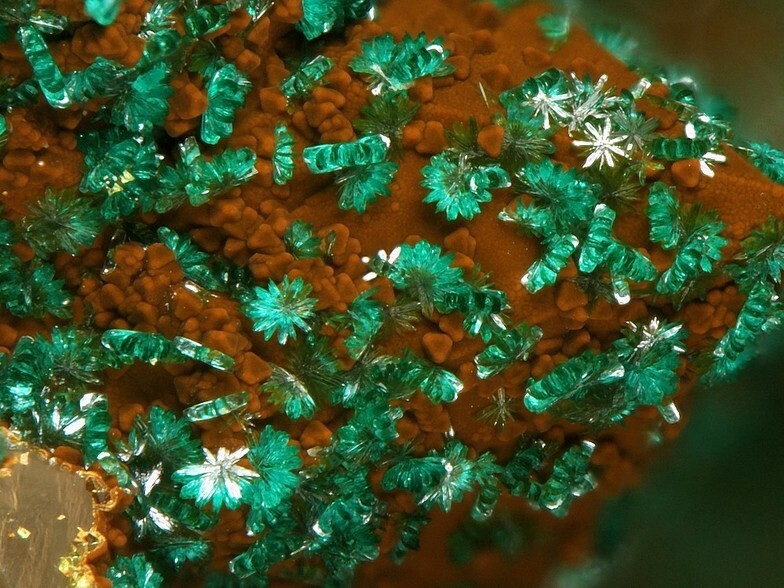 (1951) Observations on conichalcite, cornwallite, euchroite liroconite and olivenite. American Mineralogist: 36: 484–503. Palache, C., Berman, H., & Frondel, C. (1951), The System of Mineralogy of James Dwight Dana and Edward Salisbury Dana, Yale University 1837-1892, Volume II. John Wiley and Sons, Inc., New York, 7th edition, revised and enlarged, 1124 pp. : 798-799 (as Erinite), 925. Claringbull, G.F., M.H. Hey, and R.J. Davis (1959) Cornubite, a new mineral dimorphous with cornwallite. Mineralogical Magazine: 32: 1–5. Neues Jahrbuch für Mineralogie, Monatshefte (1999): 468-480. Anthony, J.W., Bideaux, R.A., Bladh, K.W., and Nichols, M.C. (2000) Handbook of Mineralogy, Volume IV. Arsenates, Phosphates, Vanadates. Mineral Data Publishing, Tucson, AZ, 680pp. : 129. Ciesielczuk, J., Janeczek, J., Dulski, M., Krzykawski, T. (2016): Pseudomalachite–cornwallite and kipushite–philipsburgite solid solutions: chemical composition and Raman spectroscopy. European Journal of Mineralogy: 28, 555-569. The following Cornwallite specimens are currently listed for sale on minfind.com. Hodkinson, I., Segnit, E.R. (1989) Olivenite and cornwallite from Wallace Gully, South Australia. Australian Mineralogist, Vol. 4. pg. 14-15. Handbook of Mineralogy - Anthony, Bideaux, Bladh, Nichols; Vera Munro-Smith (2006) Cobalt Mineralisation in Selected Australian Deposits. PhD thesis, University of Western Sydney. Auer, C., Kolitsch, U., Bernhard, F. (2017): 2050) Brochantit, Camerolait, Cornwallit, Cualstibit-1M, Devillin und Langit von den Kupferschürfen am Dürrkogel in der Veitsch, Steiermark. Pp. 272-273 in Walter, F. et al. (2017): Neue Mineralfunde aus Österreich LXVI. Carinthia II, 207./127., 217-284. R. Poeverlein and J. Gröbner (2007): "Der Bergbau Geyer bei Rattenberg in Tirol und seine Mineralien", Lapis 32(2), 34-38. R. Poeverlein, J. Gröbner & U. Kolitsch (2010): Mineralien und Bergbau vom Graschberg bei Thierbach in der Tiroler Wildschönau. Lapis 35 (3), 35-40; 54 (in German). Minceva-Stefanova, J. (2001): Arsenate minerals diversity in oxidation zones of the polymetallic stratabound deposits in Western Balkan Mountain. - Compt. rend. Acad. bulg. Sci., 54, 6, 39-42. Minceva-Stefanova, J. (2001). Arsenate minerals diversity in oxidation zones of the polymetallic stratabound deposits in Western Balkan Mountain. Comptes Rendus de l'Academie Bulgare des Sciences, 54(6), 39. Samples analysed by Dr. Jochen Schluter (Hamburg University), Germany. In the collection of Brent Thorne. Collected by Terry Szenics. Collected and raman confirmed by Bob Jenkins. Petr Pauliš (2000): Nejzajímavější mineralogická naleziště Čech, Kuttna, Kutná Hora; Sejkora, J., Ondruš, P., Fikar, M., Veselovský, F., Mach, Z., Gabašová, A., Skoda, R. & Beran, P. (2006): Supergene minerals at the Huber stock and Schnöd stock deposits, Krásno ore District, the Slavkovský les area, Czech Republic. Journal of the Czech Geological Society 51, 57-101. - ESCANDE, J.-C., JOHAN, Z., LOUGNON, J., PICOT, P. & PILLARD, F. (1973): Note sur la présence de minéraux de bismuth dans un filon de barytine et fluorine à Faymont, près Le Val-d'Ajol (Vosges). - Bull. Soc. fr. Minéral. Cristallogr. 96, 398-399. - ASSELBORN, E. (1982): Le filon des roches en Val d'Ajol. - Minéraux et Fossiles 88, 32-37. - FLUCK, P. & STEIN, S. (1992): Espèces minérales des principaux districts miniers du massif vosgien. - Pierres et Terre 35 (December 1992), 120 pp. - L'HEUR, C. & MOREAU, F. (1994): Les minéralisations du filon du Bas Hérival près du Val d`Ajol (Vosges). – Le Cahier des Micromonteurs, 2, 3-14. - HOHL, J. L. (1994): Minéraux et Mines du Massif Vosgien. - Ed. du Rhin, Mulhouse, Frankreich. - U. Kolitsch (1997): New mineral occurrences from some localities in the Vosges, France: Triembach, Bluttenberg and Val d'Ajol. Aufschluss 48 (2), 65-91. (in German) - Favreau, G. et Iltis, A. (2000): Données complémentaires sur les minéraux du Val d'Ajol (Vosges). Le Cahier des Micromonteurs, (1), 39-54. J.C. Escande, Z. Johan, J. Lougnon, P. Picot, F. Pillard : "Note sur la présence de minéraux de bismuth dans un filon de barytine et fluorine à Faymont, près Le Val-d'Ajol (Vosges)", Bull. Soc. Fr. Minéral. Cristallogr. , 1973, 96, 398-399. ; - ESCANDE, J.-C., JOHAN, Z., LOUGNON, J., PICOT, P. & PILLARD, F. (1973): Note sur la présence de minéraux de bismuth dans un filon de barytine et fluorine à Faymont, près Le Val-d'Ajol (Vosges). - Bull. Soc. fr. Minéral. Cristallogr. 96, 398-399. - ASSELBORN, E. (1982): Le filon des roches en Val d'Ajol. - Minéraux et Fossiles 88, 32-37. - FLUCK, P. & STEIN, S. (1992): Espèces minérales des principaux districts miniers du massif vosgien. - Pierres et Terre 35 (December 1992), 120 pp. - L'HEUR, C. & MOREAU, F. (1994): Les minéralisations du filon du Bas Hérival près du Val d`Ajol (Vosges). – Le Cahier des Micromonteurs, 2, 3-14. - HOHL, J. L. (1994): Minéraux et Mines du Massif Vosgien. - Ed. du Rhin, Mulhouse, Frankreich. - U. Kolitsch (1997): New mineral occurrences from some localities in the Vosges, France: Triembach, Bluttenberg and Val d'Ajol. Aufschluss 48 (2), 65-91. (in German) - Favreau, G. et Iltis, A. (2000): Données complémentaires sur les minéraux du Val d'Ajol (Vosges). Le Cahier des Micromonteurs, (1), 39-54. ; - ESCANDE, J.-C., JOHAN, Z., LOUGNON, J., PICOT, P. & PILLARD, F. (1973): Note sur la présence de minéraux de bismuth dans un filon de barytine et fluorine à Faymont, près Le Val-d'Ajol (Vosges). - Bull. Soc. fr. Minéral. Cristallogr. 96, 398-399. - ASSELBORN, E. (1982): Le filon des roches en Val d'Ajol. - Minéraux et Fossiles 88, 32-37. - FLUCK, P. & STEIN, S. (1992): Espèces minérales des principaux districts miniers du massif vosgien. - Pierres et Terre 35 (December 1992), 120 pp. - L'HEUR, C. & MOREAU, F. (1994): Les minéralisations du filon du Bas Hérival près du Val d`Ajol (Vosges). – Le Cahier des Micromonteurs, 2, 3-14. - HOHL, J. L. (1994): Minéraux et Mines du Massif Vosgien. - Ed. du Rhin, Mulhouse, Frankreich. - U. Kolitsch (1997): New mineral occurrences from some localities in the Vosges, France: Triembach, Bluttenberg and Val d'Ajol. Aufschluss 48 (2), 65-91. (in German) - Favreau, G. et Iltis, A. (2000): Données complémentaires sur les minéraux du Val d'Ajol (Vosges). Le Cahier des Micromonteurs, (1), 39-54. Hahn, F. (1991): Zum Mineralbestand des Steinbruchs Artenberg bei Steinach. 2. Folge. Der Erzgräber, 5 (2), 61-64.
ⓘ Frische Lutter vein (incl. Lutter adit; South Rothäuser adit; North Rothäuser adit) ? Koch, H.-P. (2008): Die Minerale der Grube "Frische Lutter" bei Bad Lauterberg, Harz (Teil 1). Aufschluss 59, 65-76. Henrich, M. (2008): Neues von der Grube Eisenzecher Zug. Mineralien-Welt 19 (5), 16-25. GRÖBNER, J. (2001): Roter Skorodit und weitere ungewöhnliche Arsenate: Die Mineralien des Abbaus 132 der Grube Christiana, Lavrion/Griechenland. Lapis, 26 (11), 13-21. Moreton, S. & Green, D.I. (2006) UK Journal of Mines & Minerals, No. 27, p41-4. Redazionale (2005): Sistematica ligure: resoconto 2005. Notiziario di Mineralogia del Ferrania Club, 19 , 3-5. Bedognè,F,,Montrasio; A. & Sciesa;E. (2006): I minerali della media-alta Valtellina delle Orobie valtellinesi e della Val Poschiavo. Bettini, Sondrio, Italia, 255. Ohori and Kobayashi (1996) Chigaku Kenkyu, 44, 223-232. Shirose, Y. & Uehara, S. (2011) Philipsburgite from the Yamato mine, Yamaguchi Prefecture, Japan. Journal of Mineralogical and Petrological Sciences, 106, 153-157.; Nagashima, M., Akasaka, M., & Morifuku, Y. (2016). Ore and Skarn Mineralogy of the Yamato Mine, Yamaguchi Prefecture, Japan, with Emphasis on Silver‐, Bismuth‐, Cobalt‐, and Tin‐bearing Sulfides. Resource Geology, 66(1), 37-54. Mineralogical Magazine 1972 38 : 541-544. P.M. Kartashov analytical data; Kovalenko, V. I., Yarmolyuk, V. V., Sal nikova, E. B., Kartashov, P. M., Kovach, V. P., Kozakov, I. K., ... & Yakovleva, S. Z. (2004). The Khaldzan-Buregtei Massif of peralkaline rare-metal igneous rocks: structure, geochronology, and geodynamic setting in the Caledonides of Western Mongolia. Petrology c/c of Petrologiia, 12(5), 412-436. Gebhard, G. (1999) Tsumeb II. A Unique Mineral Locality. GG Publishing, Grossenseifen, Germany. 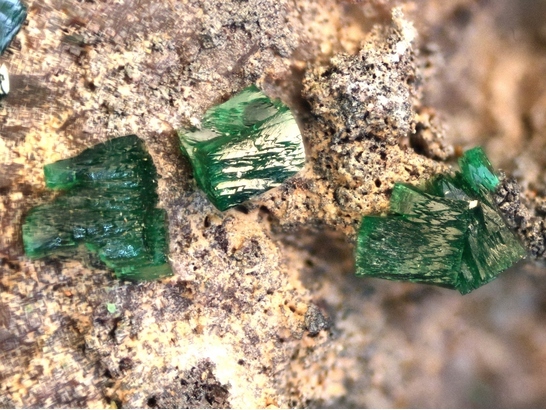 284 (in English); Von Bezing, L., Bode, R., and Jahn, S., (2008) Namibia Minerals and Localities. Edition Schloss Freudenstein, Bode Verlag GmbH, Haltern. 510 pp (in English). Domańska, J.: Rędziny. Otoczak, nr. 29, p. 38-52; Gołębiowska B., A. Pieczka, & W. Franus: "Olivenite-adamite solid solution from oxidation zone in Redziny (West Sudetes, Poland)": Mineralogia Polonica 37 (2006) 101-111. Hyršl, J., Korbel, P., Šourek, J. (1984): Cornubit a cornwallit z Farbiště u Ponické Lehotky. Čas. Mineral. Geol., 29, 4, 433-434. Števko M., Sejkora J. 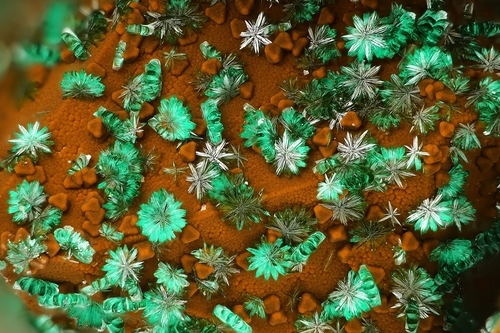 2012: Supergene arsenates of copper from Špania Dolina-Piesky deposit, Central Slovakia. Acta Mineralogica-Petrographica, Actract Series 7, 130. Sejkora J., Ďuďa R., Novotná M., 2001: Minerály oxidační zóny žíly Krížová, Gelnica, Slovenské Rudohorie. Bull. mineral.-petrolog. Odd. Nár. Muz., 9, 121-139. Števko M., Dojčanský Ľ., Volejník M., Sejkora J. (2017): Nový nález sekundárnych minerálov na Hrubej žile v Rudňanoch. Minerál, 25, 1, 87-93 (in Slovak). Řídkošil, T. (1978): Novoveská Huta-nová lokalita vzácnych druhotných nerostu mědi. Čas. Mineral. Geol., 23, 2, 214. Calvo, Miguel. (2015). Minerales y Minas de España. Vol. VII. Fosfatos, Arseniatos y Vanadatos. Escuela Técnica Superior de Ingenieros de Minas de Madrid. Fundación Gómez Pardo. 479 págs. A. Carmona & I. Ramos Collection. Calvo, M. (2015): Minerales y Minas de España. Vol. VII, Fosfatos, arseniatos y vanadatos. Escuela Técnica Superior de Ingenieros de Minas de Madrid - Fundación Gómez Pardo. 479 pp. - Sainz de Baranda, B.,González de Tánago, J. y Viñals, J. (2003). Secondary minerals of the Mazarrón-Águilas mining distric. Murcia province, Spain. The Minerlógical Record, 34, 315-334. - Sainz de Baranda, B.,González de Tánago, J. y Viñals, J. (2003). Secondary minerals of the Mazarrón-Águilas mining distric. Murcia province, Spain. The Mineralógical Record, 34, 315-334. Joan Vinals & Miguel Calvo (2007) Corderoite, Kenhsuite and Perroudite, mercury sulphohalides from Chovar (Xovar), Castello, Spain. Mineral Up, June 2007. Handbook of Mineralogy - Anthony, Bideaux, Bladh, Nichols; Mineralogical Magazine 1959 32 : 1-5.; Goley, P. and Williams R. (1995) Cornish Mineral Reference Manual. Endsleigh Publications; Kloprogge, J. T., & Wood, B. J. (2017). X-ray Photoelectron spectroscopic and Raman spectroscopic study of bayldonite from Wheal Carpenter, Cornwall, UK. Vacuum, 141, 49-56. Miers, H.A. (1894) Spangolite. Mineralogical Magazine, vol. 10, n° 48, 273-277.; Goley, P. and Williams R. (1995) Cornish Mineral Reference Manual. Endsleigh Publications. ; Anthony, Bideaux, Bladh, and Nichols (xxxx) Handbook of Mineralogy. Cooper, M.P. and Stanley, C.J. (1990) Minerals of the English Lake District: Caldbeck Fells. Natural History Museum Publications, London, 160 pp. Kingsbury, A.W.G. and Hartley, J. (MS) (1951) New occurrences of rare minerals in the northern part of the English Lake District: part 1.; Claringbull, G.F., Hey, M.H., and Davis, R.J. (1959) Cornubite, a new mineral dimorphous with cornwallite. Mineralogical Magazine, 32, 1-5.; Shaw, W.T. (1970) Mining in the Lake Counties. Dalesman Books, Kendal. [2nd edition 1975 incorporating minor changes]. ; Hartley, J. (1984) A list of minerals associated with the ore deposits of the Caldbeck Fells, Cumbria. Transactions of the Leeds Geological Association, 10(3), 22-39.; Cooper, M.P. and Stanley, C.J. (1990) Minerals of the English Lake district: Caldbeck Fells. Natural History Museum Publications, London, 160 pp. (referring to Kingsbury & Hartley, 1951, Claringbull, 1959, Shaw, 1970, and Hartley, 1984). ; Anthony, J.W., Bideaux, R.A., Bladh, K.W., and Nichols, M.C. (xxxx) Handbook of Mineralogy. ⓘ Bampfylde Mine (Prince Regent Mine; Poltimore Mine; North Molton copper mine) ? Rushton, D. R. A. (1972). Arsenates of copper from Shetland. Mineralogical Magazine, 38(297), 626-627. Palache, C., Berman, H., & Frondel, C. (1951), The System of Mineralogy of James Dwight Dana and Edward Salisbury Dana, Yale University 1837-1892, Volume II: 798. Anthony, J.W., et al (1995), Mineralogy of Arizona, 3rd.ed. : 177, 188. Anthony, J.W., et al (1995), Mineralogy of Arizona, 3rd.ed. : 188. Kampf, A.R., Housley, R.M., Rossman, G.R., Marty, J., Chorazewicz, M. (2018) Bodieite, Bi3+2(Te4+O3)2(SO4), a New Mineral from the Tintic District, Utah, and the Masonic District, California, USA. Canadian Mineralogist: 56: 763-772. Dunning, G.E., Cooper, J.F. (2005) Mineralogy of the Spring Creek area, Last Chance mining district, Plumas County, California. Axis: 1: 1-30. Martin Jensen and Tony Nikischer (2012) Some notes on the mineralogy of the Black Pine Mine, Granite County, Montana. Mineral News, 28, #6, 1-10. Dana, E.S. (1892) System of Mineralogy, 6th. Edition, New York: 1092; Palache, C., Berman, H., & Frondel, C. (1951), The System of Mineralogy of James Dwight Dana and Edward Salisbury Dana, Yale University 1837-1892, Volume II: 579, 798. Dana, E.S. (1892) System of Mineralogy, 6th. Edition, New York: 1092.; Miers, H.A. (1894) Spangolite. Mineralogical Magazine, vol. 10, n° 48, 273-277.; Palache, C., Berman, H., and Frondel, C. (1951) The System of Mineralogy of James Dwight Dana and Edward Salisbury Dana, Yale University 1837-1892, Volume II: 562.; Rocks & Minerals: 63: 130. Min Rec 24:1 pp11-22; Adams, P.M. (2005): Zalesiite from the Gold Hill Mine, Toole County, Utah. Mineral News, 21(8), 1; 3; 5. SEM-EDS analzyed by Dr. Rob Bowell.